WWE Hall of Fame (Class of 2013). 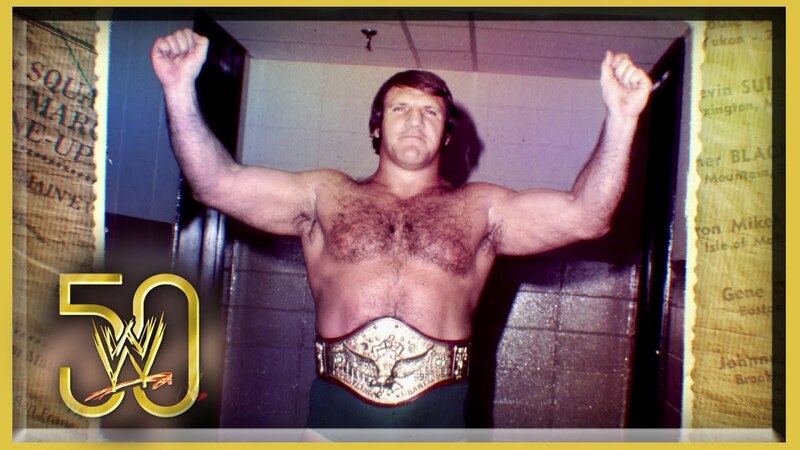 Sammartino held the WWWF World Heavyweight Championship for over 11 years (4040 days) across two reigns, the first of which is the longest single reign in the promotion’s history (2803 days). Sammartino’s wrestling style was more mat-oriented which was typical of wrestlers from his era. His brawling, power moves, and personal charisma helped him become the most popular American wrestler in the 1960s through the mid 1980s. He was inducted into the WWE Hall of Fame on April 6, 2013 by his longtime friend, Arnold Schwarzenegger. Bruno defeated Buddy Rogers, the first WWWF Champion, in 48 seconds on May 17th 1963. After defending the title for almost eight years, Bruno lost the title to Ivan Koloff on January 1971. The crowd fell silent after the match, out of disbelief. The referee held Ivan Koloff’s arm up three times before Koloff left the ring without the WWWF Championship. It was feared a riot could happen, so Bruno stayed in the ring after the match, and once he started to leave, fans cried. Sammartino won the title back almost three years later, and he would defend that title against many contenders for another four years, until “Superstar” Billy Graham cheated to take the title from him. Sammartino continued to wrestle until 1988, when an incident involving the firing of his son gave him enough reason to leave the WWF and retire. Over the years, Bruno was an outspoken critic of the path McMahon had taken pro wrestling, particularly in the use of steroids, other illicit drugs and borderline obscene wrestling angles. In the last stage of his career, he refused to travel with the younger wrestlers for fear of being stopped in a vehicle containing drugs. McMahon provided wrestler-turned-road-agent Chief Jay Strongbow as a travel partner. Sammartino is a wrestling purist, and appreciates the best workers in the business. He turned down an invite to Raw in 2004 as he did not want to endorse the product. He admitted to Triple H that he would have reconsidered if the main event was Chris Benoit vs Kurt Angle instead of Chris Benoit vs Triple H, as he is a big fan of Kurt Angle. He has appeared in different forms for Ring of Honor and Total Nonstop Action Wrestling. After many years in retirement, criticizing Vince McMahon and the WWE product, he participated in a series of independently-produced documentaries highlighting his career. The WWE purposely ignored his historic title reigns for many years despite the significance of it. Triple H approached Bruno Sammartino, (as Triple H understood how important his title reigns are to the Hall of Fame) in an attempt to induct him into the Hall of Fame after Bruno turned it down many times. Bruno agreed to join the Hall of Fame after Triple H proved the changes WWE had made to their product fit the changes Bruno wanted to see as far back as the 1980’s. Sammartino and Vince McMahon reconciled their differences, and WWE was finally able to induct the longest reigning WWWF/WWF/WWE World Heavyweight Champion. He died on April 18, 2018, at the age of 82 from multiple organ failure due to heart issues. vs Billy Graham in 1977.